Visual Studio Code>Themes>Srcery (official port)New to Visual Studio Code? Get it now. This code is from the neovim-qt project. This theme is a work in progress, if you see something that is off or doesn't work please open an issue so it can be fixed. Clone the Git repository somewhere. Open the folder in VSCode. And now, when you launch 'Extension', you will have another instance of Visual Studio code with all your settings, except that the colorscheme will be loaded from the cloned repo instead of being pulled from your extensions. 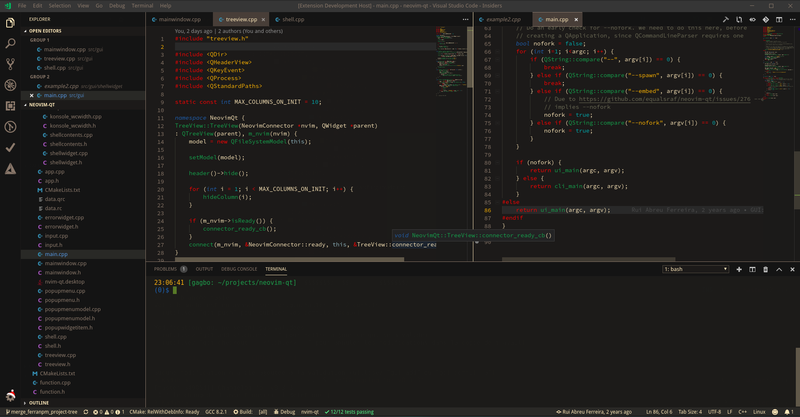 Thanks to bpruitt-godard for his port of Sourcerer, which helped me a lot to build a first working port of Srcery theme.